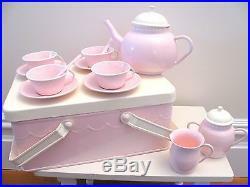 Very very cute pink metal tea set from Pottery Barn Kids. Comes with it’s own metal storage container. 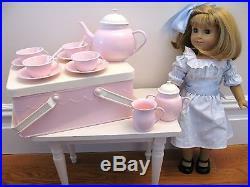 Please note, dolls, playfood and table not included in this listing. 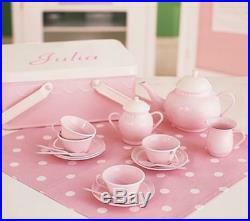 Tea set is brand new in box. 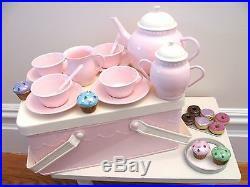 Comes with 4 teacups, 4 saucers, 4 spoons, teapot, sugar bowl and creamer. There is no name on this tea set as is shown in one photo. 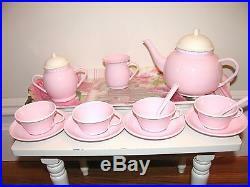 The tea set shown in the pictures is my daughter’s tea set. The one you will be getting is in a brand new, unopened box. Smoke-free, pet-free, very clean home. 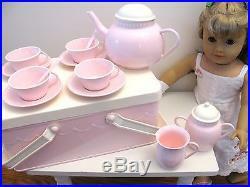 The item “New Pottery Barn Kids Pink Metal Tea Set Picnic Basket Storage for Doll or Girls” is in sale since Saturday, December 17, 2016. 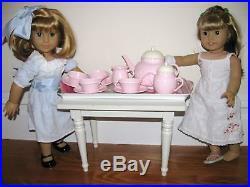 This item is in the category “Toys & Hobbies\Preschool Toys & Pretend Play\Dishes, Tea Sets”. The seller is “julia*s-rose-petals-and-potions” and is located in Purchase, New York. This item can be shipped to United States, Canada, United Kingdom, Denmark, Romania, Slovakia, Bulgaria, Czech republic, Finland, Hungary, Latvia, Lithuania, Malta, Estonia, Australia, Greece, Portugal, Cyprus, Slovenia, Japan, China, Sweden, South Korea, Indonesia, Taiwan, South africa, Thailand, Belgium, France, Hong Kong, Ireland, Netherlands, Poland, Spain, Italy, Germany, Austria, Israel, Mexico, New Zealand, Philippines, Singapore, Switzerland, Norway, Saudi arabia, Ukraine, United arab emirates, Qatar, Kuwait, Bahrain, Croatia, Malaysia, Brazil, Chile, Colombia, Costa rica, Dominican republic, Panama, Trinidad and tobago, Guatemala, El salvador, Honduras, Jamaica, Antigua and barbuda, Aruba, Belize, Dominica, Grenada, Saint kitts and nevis, Saint lucia, Montserrat, Turks and caicos islands, Barbados, Bangladesh, Bermuda, Brunei darussalam, Bolivia, Ecuador, Egypt, French guiana, Guernsey, Gibraltar, Guadeloupe, Iceland, Jersey, Jordan, Cambodia, Cayman islands, Liechtenstein, Sri lanka, Luxembourg, Monaco, Macao, Martinique, Maldives, Nicaragua, Oman, Peru, Pakistan, Paraguay, Reunion.